Webcast listening in March grew by 2% compared to February, and notched a 15% rise year-over-year, according to Triton Digital’s monthly Webcast Metrics Top 20 Ranker, released this morning. Stream listening grew 10% in the first quarter, led by double-digit percentage gains for the top three outlets measured in the Ranker — Pandora (+10%), Spotify (+11%), and iHeartRadio (+12%). The Triton Digital Ranker includes most major webcasters, both pureplay (Pandora and Spotify being the leaders) and broadcast radio streams (where iHeartRadio leads). As always in RAIN News tracking, we use Average Active Sessions (AAS) as the key metric, through the lens of 6:00am – 12:00am listening, Monday through Sunday. In the year-over-year comparison, AccuRadio stands out for its remarkable 81% listening gain. 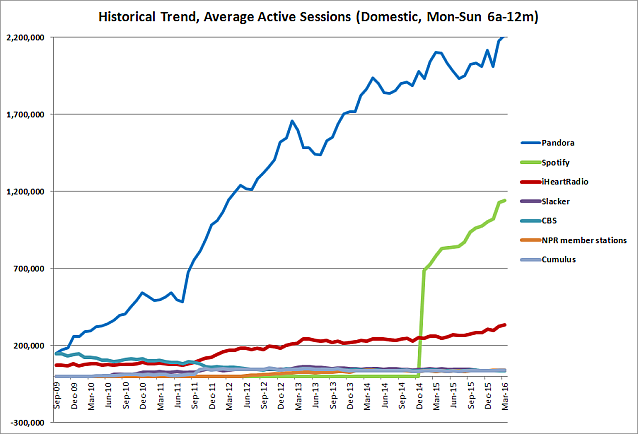 Spotify stream sessions grew 41% from March 2015. 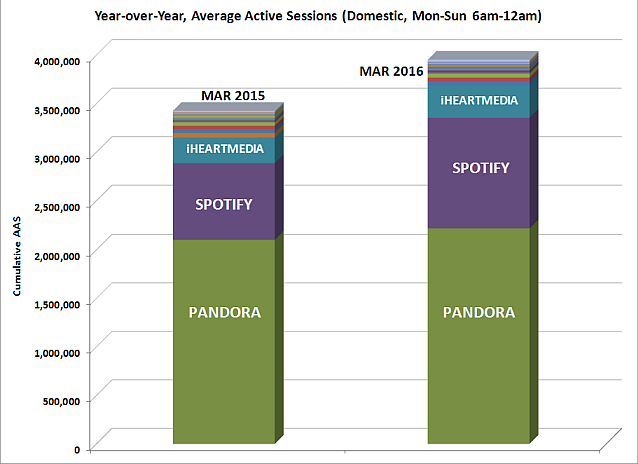 Volume group leader Pandora served 5% more streams on average compared to the same month last year.